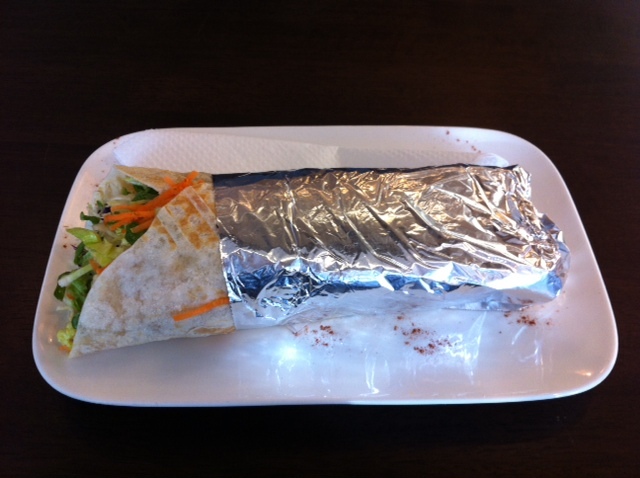 Lunch on Tuesday found me at Anatolia Kebab House where I ordered their Falafel Wrap. They have a choice of fillings – lamb, chicken, beef, zucchini fritters, falafel etc with your choice of 2 of 5 sauces – their “special” sauce, garlic, chili, sweet chili and BBQ. I went with their special sauce and the garlic one. I know from past experience that the chili sauce has a bit of a burn to it. They also do wraps, pita pockets and iskendar (on a plate with rice). I’ve eaten here a couple of times, usually I’d go with the zucchini wrap but last time they didn’t have it so I got the falafel. I’ve been put off falafel over the years with tough, hard, bullet like ones, but the ones at Anatolia Kebab House are delicious. For $11, it was a good filling and reasonably healthy lunch – piping hot on the outside and stuffed with salad and falafel. Just the right amount of sauce so it didn’t go soggy at the bottom. 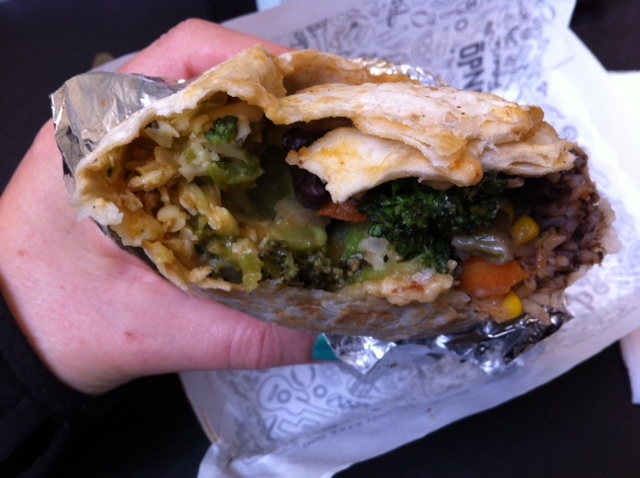 I also liked the wrap as it was thin and not too thick and chewy. 4/5 – I couldn’t fault it but it wasn’t wow enough to give it a 5/5. Tuesday night, I decided to go to Saigon Van. I passed this last week and put it on my list to return to. They had a number of items on the menu clearly marked as vegetarian. As a traveller and someone that loves food, Vietnam was one of the best places to go and eat. I swear I ate my way from Hanoi to Ho Chi Minh city. I ordered the Braised Mushrooms with Tofu – in a claypot. Now I know that I am not getting the claypot as takeaways, but that shouldn’t make any difference to what you get – same mean without the claypot. So I ordered, I had only just been sitting for a couple of minutes, I had just put away my receipt and started to check my emails when I was called to get my meal. Wow talk about fast service! It was so quick, I checked in the bag to make sure it was actually my order and not someone elses. Back to my unit I went. First impression was that it wasn’t a lot of food and no way I could serve half of it for tomorrow’s lunch without going hungry tonight. In hindsight this was a good thing. The salad was a nice touch though. Also, the food was barely warm, sure I walked back to my unit but most other takeaways are still piping hot when I get there and don’t need reheating. I will start with the good – I liked the salad – simple with a very light, barely there dressing. Then… the not so good. The carrots were very soft, almost mushy. There is no way on earth they could have cooked these carrot from raw in the time I was sitting there to that level of softness. They were also super salty. The tofu was also very salty. 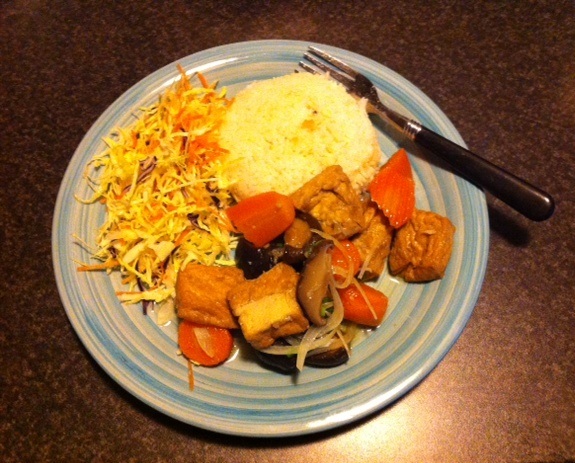 The mushrooms were good but failed to drown out the carrots and tofu. I give it 1.5/5 – and only because it was edible but only just. I would not go back. Lunch on Wednesday took me to the Meridian Mall downstairs foodcourt. I was on a mission to get lunch but also I need to get something for dinner to takeaway and reheat (due to working at a remote location in the evening). I decided for lunch to try Chilando Mexican Taqueria. I ordered the Vegetariano Burrito which was made in front of me and included Mexican Rice, Black Beans, mix grilled vegetables, cheese, guacamole and salsa. There were three choices of sauce, I chose the medium spiced one. 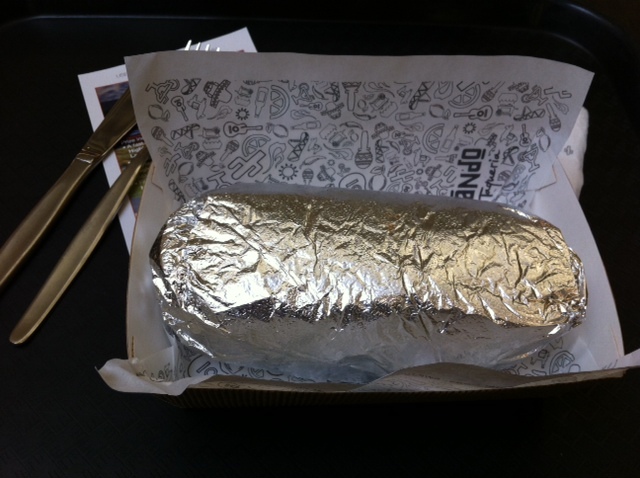 It was then wrapped and placed under the grill for a minute or two. I very much enjoyed this. It was tasty and the different flavours really stood out. The mixed grilled vegetables were particularly tasty. I believe they also offer a selection of Mexican soft drinks along with the usual soft drinks in the coke range that you see everywhere. We don’t see a lot of Mexican food in New Zealand. I’m always surprised that Taco Bell hasn’t made it here since we seem to have all the other US brand fast foods. Its nice to see this small chain starting to make its way around the country. Their website says they have locations in Auckland, Tauranga, Nelson and Dunedin. Its great to see this as an option in the local mall foodcourt. To see their full menu, you may like to have a look here. I give this a 4/5. I would definitely go back and order this again. It was very filling for $10.50. I notice they do a small version of this along with Tacos and Nachos plus a couple of salads. I decided one more time to give Spice Traders in the foodcourt a try. This was disappointing last time I tried it but that was over 6 months ago, so to be fair, I thought I’d give them another chance. This time I choose the Mushroom Paneer which was served out of a bain-marie and listed as medium spiced. 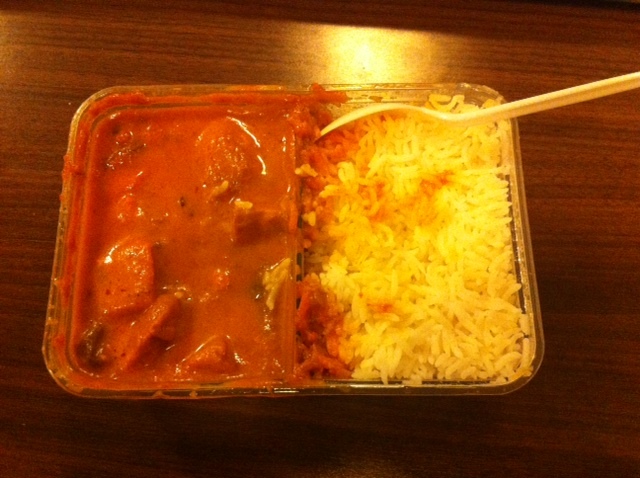 And as I mentioned above, I purchased this curry and then reheated it for dinner – the plastic container had on the lid “microwave safe”. It definitely wasn’t medium in my opinion, it was definitely mild. The curry sauce was fairly runny and not too creamy for this sort of dish. It was actually better than I expected based around my experience here last time. I would give it 3/5 – I wouldn’t go out of my way to go here but I might get this again if I was in the mall and fancied lunch or dinner of the Indian variety. It was also pretty cheap at $7. 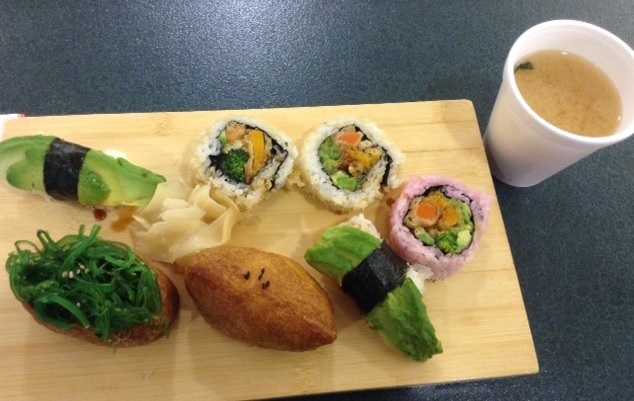 Back to the mall on Thursday for lunch for a return visit to Hikari Sushi in the downstairs foodcourt. As well as doing cooked to order meals, they have two cabinets full of various sushi – inari, nigiri and sushi rolls. Essentially you put your choice of items onto the wooden board or into a plastic takeaway container and they give you the total at the end. The setup is fairly impressive as each item is clearly labeled with details of what it is and the ingredient list. As you can see by the picture, I chose two avocado nigiri, two inari – one with seaweed salad and 3 vegetable tempura rolls. Total including the miso soup was $10.90. I give this 5/5 – this was excellent! Each and every item was delicious! Looking at reviews for places to eat in Dunedin, one that rated highly and intrigued me was Formosa Delight Cafe. It tends to be listed under Chinese cuisine but actually is Taiwanese with their niche being healthy and organic Taiwanese food with extensive vegetarian and vegan options. The location itself is right next to the University, a short walk from the Otago Museum. 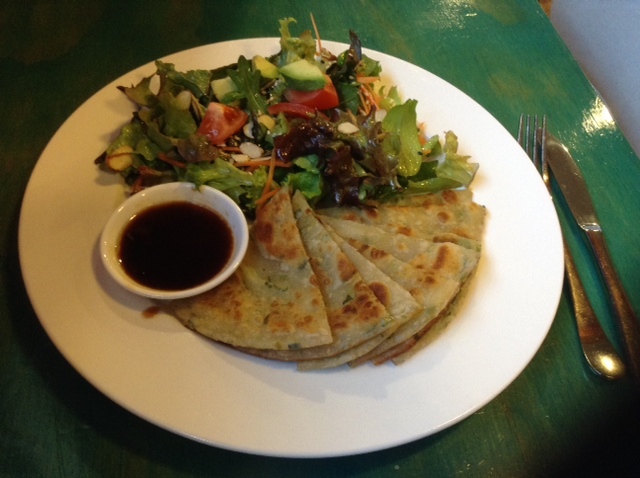 I chose the Chive pancakes with salad which was $13.80. A number of people mentioned they liked the pancakes and I thought they sounded interesting. The meal looked beautiful! The salad was delicious – fresh and the dressing wasn’t too heavy. The pancakes were crispy and went beautifully into the soy based sauce. I would go back here in a heartbeat – if it wasn’t so far to walk from my accommodation. Without a doubt 5/5. Love the purple rice used for the vegetable maki roll. I haven’t seen the purple rice before and it certainly made it very pretty. An interesting and varied week of dining out.